What’s The Difference Between Total Revenue and LTV? Developers use the terms "total revenue" and "LTV" interchangeably too often. This isn’t accurate. There are crucial differences that set these terms apart. Failing to consider these differences leads companies to misinterpret app performance and make poor business decisions. In order to keep your growth initiatives on-track and cost-effective, let's clarify the differences and look at examples that help illustrate each term’s unique applications. The word “revenue” refers to the amount of income recorded from all users over a set time period. Note that the date of the user's acquisition isn’t a factor here. LTV is the amount of income generated by a group of users that share the same lifetime, over a set time period. The difference between LTV and revenue is that the act of segmentation is inherent in the calculation of LTV. When we talk about LTV, we’re talking about grouping revenue by user lifetimes. When strictly discussing revenue, user lifetimes are not considered. Then how do we define “user lifetime”? This term refers strictly to the amount of time a user has been using your service. If measured in days, it's the difference between today's date and the date that the user first interacted with your product. In the mobile app world, this almost always refers to the date on which the user first started up your app on their mobile device. It’s worth noting that user lifetime does not start on the date the app was installed, as it’s entirely possible the user waited between installing your app and first booting it up. If a user started using your product on January 1st and today is January 10th, then that user’s lifetime would be 9 days (10 - 1 = 9). If a user was acquired on January 2nd, their lifetime would be 8 days, and so on. Following this logic, every day your app is live it generates a new user lifetime segment. 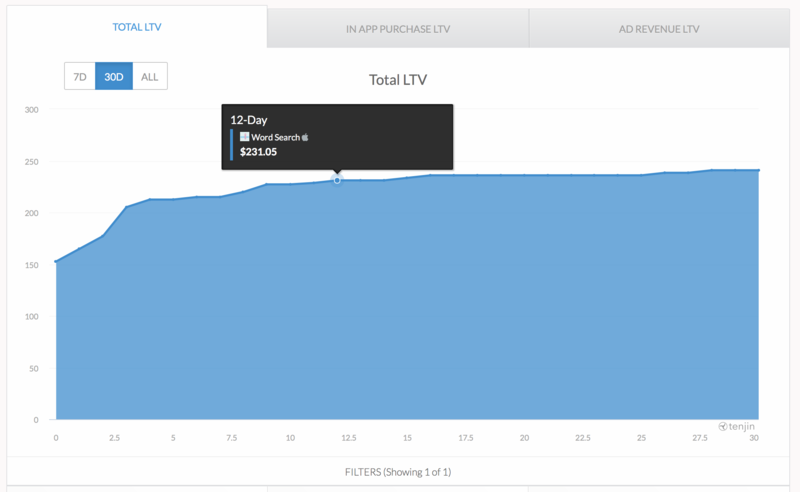 Consequently, every day your app is live it also creates a new grouping of users that we can use to calculate LTV. This is done by summing the total revenue generated by that segment between the day of analysis (today) and their acquisition date. To get an even better understanding, let’s examine this concept from a different angle by considering how users are acquired. Regardless if User A is acquired on January 1st or if User B is acquired on January 10th, both of them, at some point in time, had only been interacting with the product for a single day. As a result, they would both belong to a segment we could easily call "Day-0 LTV". If today is January 10th however, only User A could belong to a segment called "Day-9 LTV". User B hasn't been around for 9 days, simply because today is January 10th, and it isn't possible for them to have been using the product that long. To make things even clearer, let’s look at some data. The graph above shows daily revenue for an app over the entire course of 2017. On any given day, there could (hopefully!) be a mix of revenue generated from different users acquired at different times, i.e. different lifetimes. For instance, the amount of revenue generated on January 13th, seen in the tooltip above, could have been generated by multiple users acquired between January 1st through January 13th. Said another way, January 13th’s revenue can be made up of "Day-12" users or "Day-0" users, respectively. There's no way to tell the difference. This is most important difference between revenue and LTV. The chart above analyzes the same date range (all of 2017), but we’re not plotting dates along the X axis. Instead we’re using it to organize revenue according to user lifetime segments. 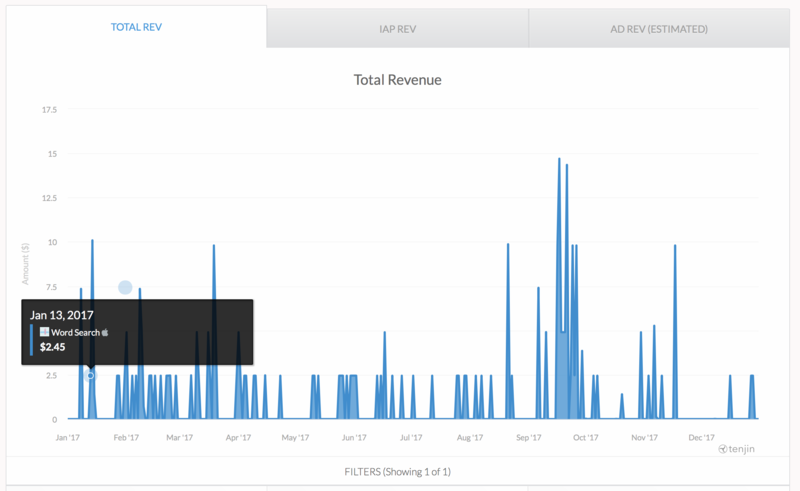 The tooltip showing "Day-12 LTV" refers to all the revenue that was generated by all the users that had a "Day-12" in 2017. The primary use-case for this type of analysis is to give marketers the ability to look at how users generate income for their apps according to when they were acquired, and use that information to optimize both pre and post-funnel strategies. Total revenue can fluctuate from day to day as a result of multiple cohort behaviors, but by aligning each user's lifetime on the same time scale, you can understand and predict user behavior and income more effectively. 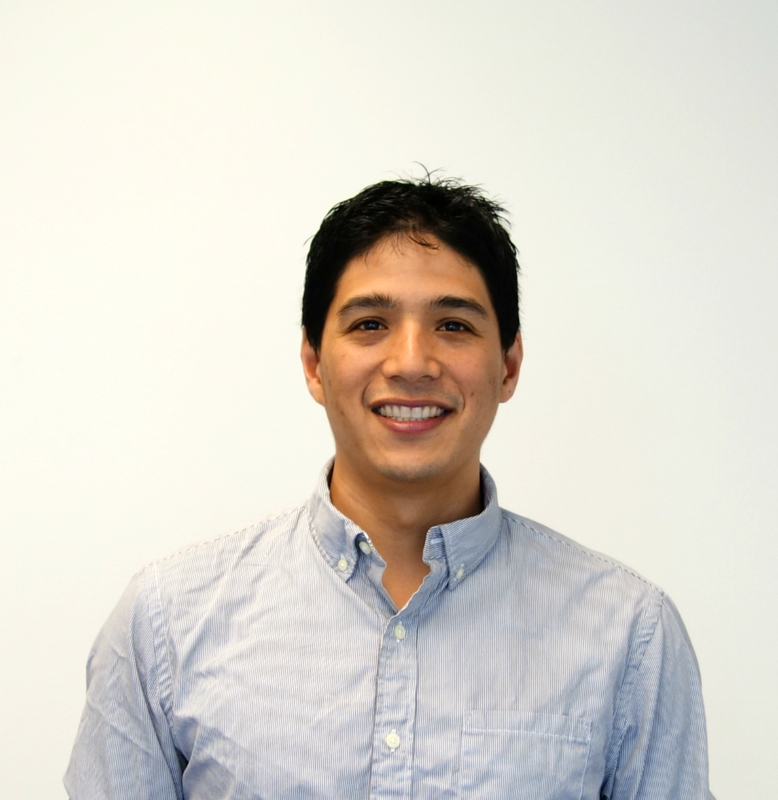 It’s a game-changer for any app publisher looking to scale their efforts, and it’s a small part of what’s made possible by the Tenjin growth data infrastructure. Get in touch to learn more or to request a demo.